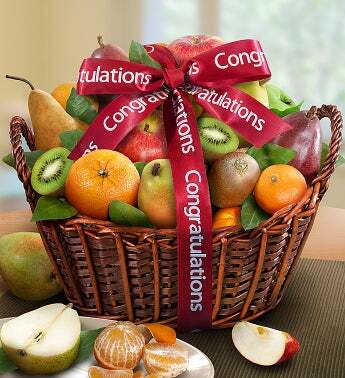 Send a special congratulations their way with this hand-woven, real wicker gift basket filled with Beurre Bosc, Red Sensation and Imperial Comice Pears, plus Fuji and Granny Smith Apples, Navel Oranges, Kiwi and more! It’s the perfect gift for health fans, friends and family everywhere! Kosher, OU Arrives orchard-fresh, ripe and ready to eat and tied with a tasteful gift ribbon!